Hi Rakesh is it not possible to place contract activation logic in another action instead of creating a new process? 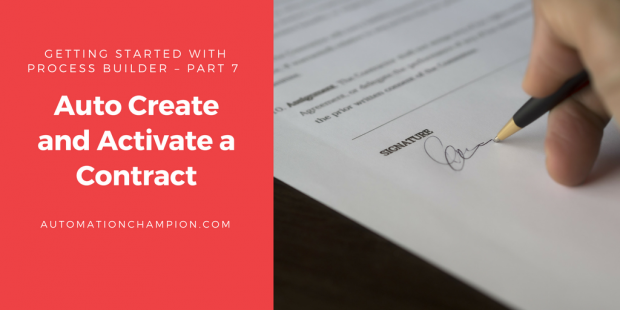 Once contract record is created in Draft , in another action we can activate it right?? I have made a small change and try to figure out what we can do now in this scenario? I have merged both process builder. by creating one more action in first process. now what i did here => i cloned the contract and create 4 new contract with draft status. i changed the status field of same opportunity and again set to closed won. can you please help me if I want to update only the new contract then what should I do? I need some time to think – but the best possible solution is to use Flow – Where Record Lookup element will allow you to sort the record based on CreatedDate or any field. Nice post Rakesh, please suggest how can we link the Contract (Lookup) standard field once the Contract is created by Process Builder. Thank you Rakesh, this was just about spot on for a process I needed to build out. If I wanted to go a bit further and have a Contract Payment record created for each month of the term is that something I can achieve with Process Builder as well? Yes you can, use a scheduled action. Wonderful! So simple, yet so powerful! Thank you!